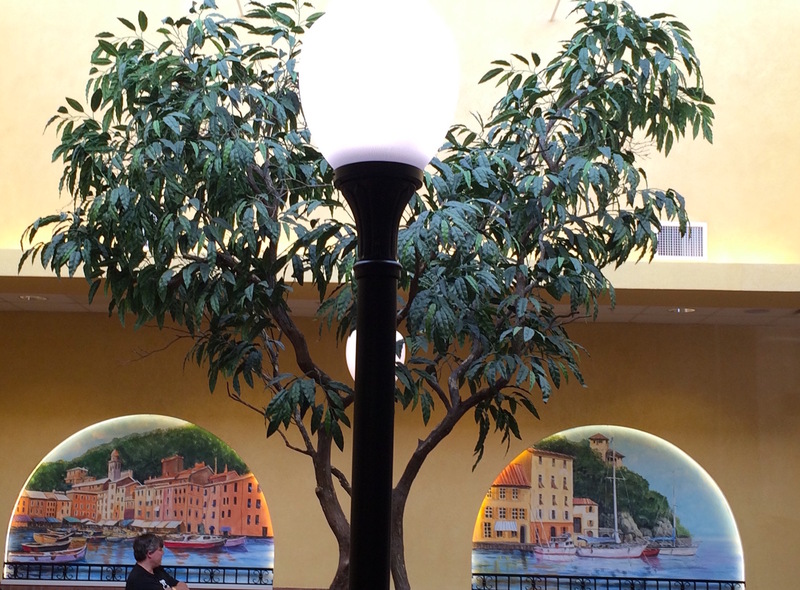 Marion’s Piazza in Mason – Go There. Try That. My family’s love affair with Marion’s Piazza goes way back! In fact, some of my fondest memories are associated with Marion’s. As a kid, my Mom used to take me to see the Kenley Players perform at Memorial Hall in Dayton. The Kenley Players, a summer acting troupe of sorts, produced these fabulous musicals starring celebrities such as Rosemary Clooney, Gary Sandy, Barry Williams, Betty White, Mickey Rooney, Rob Lowe, and Tim Conway. After the show, we would leave Memorial Hall and drive over to Marion’s Piazza to eat, meet, and mingle with the stars. It was a cast party of epic proportions. (OK, we didn’t actually share a table with them, but we got many autographs and photos.) In fact, all you WKRP in Cincinnati and Brady Bunch fans, I have a picture of Gary Sandy and Barry Williams, who starred in Kenley’s production of Grease, kissing me on the cheek! Even as a young girl, I was smitten! To this day, there are pictures of celebrities, all enjoying their pizza, lining the walls of various Marion’s restaurant locations. However fond they are, my love for Marion’s goes beyond my memories. I crave this pizza! This year I made my friends drive up to the Mason location to celebrate my birthday! You’re never too old for a pizza party! Reserving tables ahead of time is no problem here. Let me explain what I love so much. The crust is super thin and dusted with cornmeal, the pieces are cut in bite-size squares, and the toppings, which are finely diced, cover edge-to-edge. Every piece of pizza is loaded. No empty crust crying out for toppings. I also don’t like super sweet sauce, and Marion’s does the sauce just right! 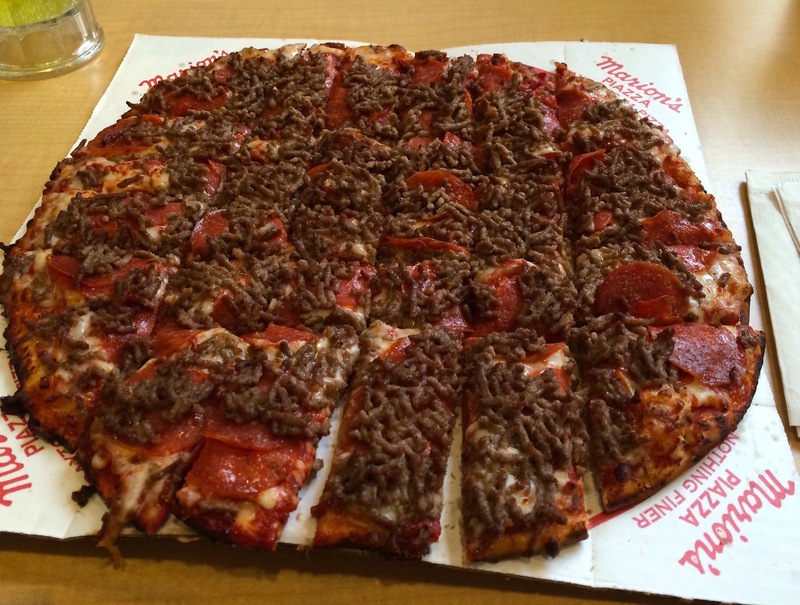 Without a doubt, Marion’s is a Dayton, Ohio hometown superstar. I’ve been to many Marion’s locations. 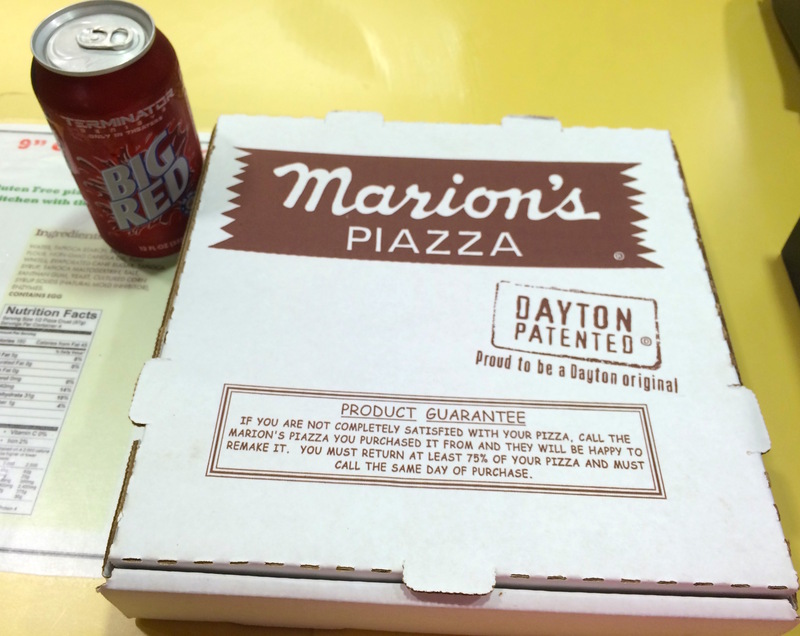 I often meet my parents for dinner in Dayton and the only “pizza pie” my dad likes is Marion’s. It’s our special spot. Each location is the same: walk-in, go up to the counter and place your order, get a ticket with a number on it, walk to the drink kiosk and order drinks (or pick something special out of the coolers), grab a table, and wait for your number to be called. 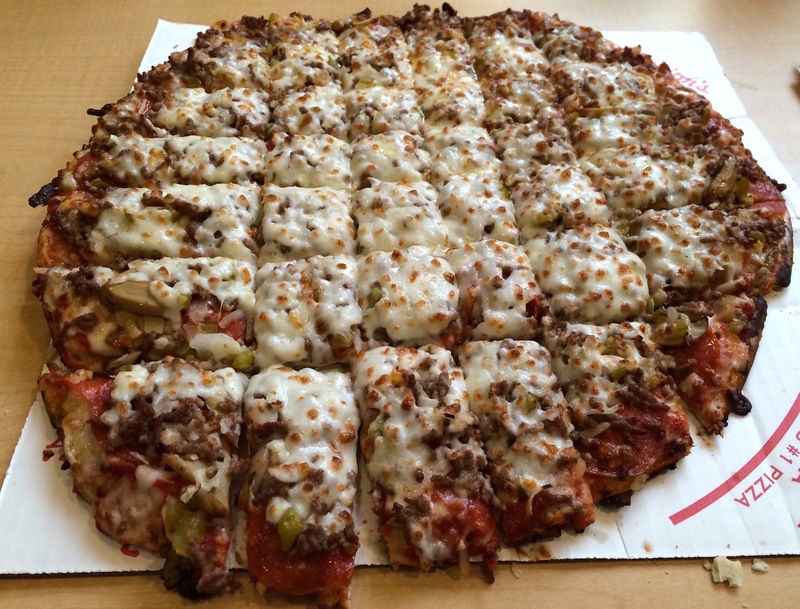 This pizza only comes in two sizes: 9-inch and 13-inch. Go for the 13-inch! Tip: The corners are the best; grab the corner pieces before anyone else can! We’ve even made a pit stop in Dayton, at a Marion’s location right off I-75, on our home back to Cincinnati from Anna, my hometown. Marion’s carry-out AND a cold can of Big Red? Score! Who says you can’t eat pizza and drive? 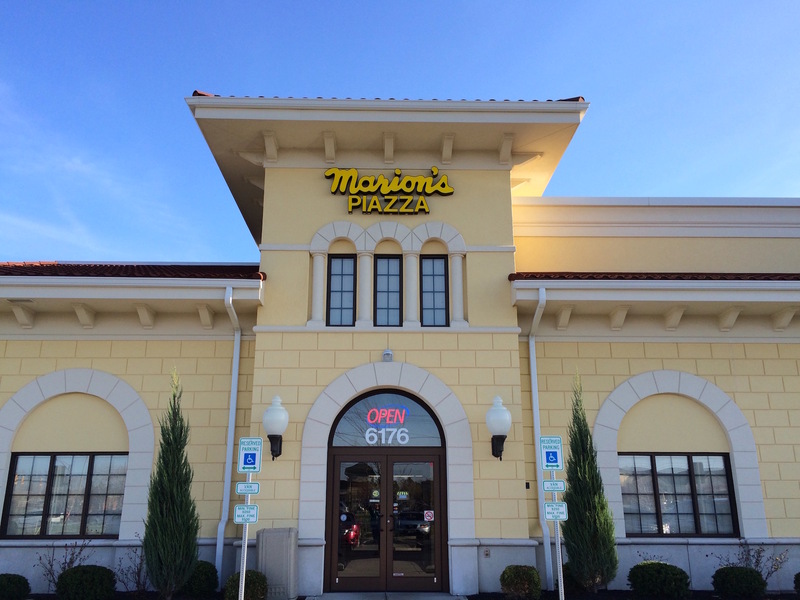 Marion’s Piazza (named Piazza because of the open, courtyard design inside) has eight locations in the Dayton area and a newer location in Mason! It’s spacious, bright, family-friendly, and you can watch the pizza-making process. Dayton and Marion’s might be synonymous, but Cincinnati people, Mason is waiting for you. . .
GO THERE (Marion’s Piazza)! TRY THAT (Super Cheese)! Frida 602 in Covington IGBY's (downtown Cincy) + a Giveaway!